Is the African buffalo a dangerous animal? 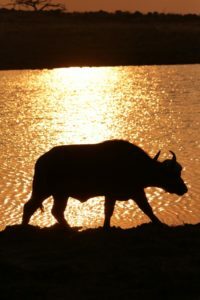 The reason early trophy hunters included the African buffalo as one of the Big 5 is that they were considered to be one of the most dangerous species to hunt. 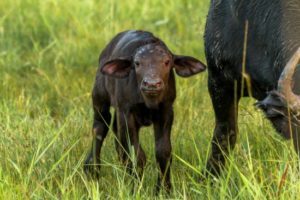 In general, Buffalo in herds are placid, although some of the old bulls in the herds tend to be easily angered and prone to charge when disturbed. Large herds are usually very relaxed and unlikely to attack. Joe joined us as a Tracker, and his roots in tracking are deep. His Game Drives are usually filled with action and he likes to get as close as possible to these big beasts. Joe’s incredible ability to read animal behaviour becomes apparent in situations like this. 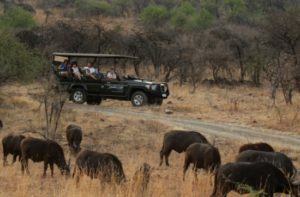 You’ll often find yourself right in the middle of a Buffalo herd with Joe – this is when he will ask all those seated to remain still as the Dominant bull approaches, knowing that this bull in particular has a temper. Occasionally a full-scale fight occurs, where combatants will charge each other with their heads up, and at the last moment, lower their heads for a bone-crunching crash. The weaker bull will be pushed sideways and immediately breaks and runs to avoid a horn in the flank. Did you know that when two 800kg African buffalo bulls charge towards each other head-on, the impact is equivalent to a car hitting a wall at 50km/h? Watch out for these incredible beasts on your next Game Drive.